Starring Jessica Chastain, Idris Elba, Kevin Costner, Michael Cera, Chris O’Dowd, Jeremy Strong and Graham Greene. 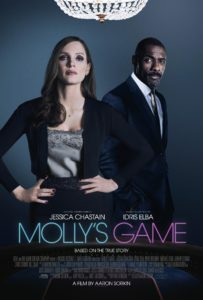 Molly Bloom comes from a high-achieving family and becomes an Olympic skier but, when her luck runs out on the piste, she has to find another way of earning money and becomes involved in the world of high stakes poker – private games involving movie stars, musicians and anybody with plenty of cash to flash. She starts running them herself, makes a lot of money at it – until she also becomes a target for the mob. And the FBI. Based on a true story. Hands up anybody who thought Aaron Sorkin had already directed a film. A career that’s encompassed A Few Good Men, TV’s The West Wing and screenplays for The Social Network, Moneyball and Steve Jobs all mean he’s been around for so long that he must’ve taken up the director’s chair by now, right? But Molly’s Game is his first. And it’s been worth waiting for. Not that he’s shunned writing the script as well. He’s taken the book by the real Molly Bloom of the title and turned it into a crime thriller, but not of the conventional sort, the story of a highly intelligent woman with a head for figures who plays the men at their own game and wins hands down. 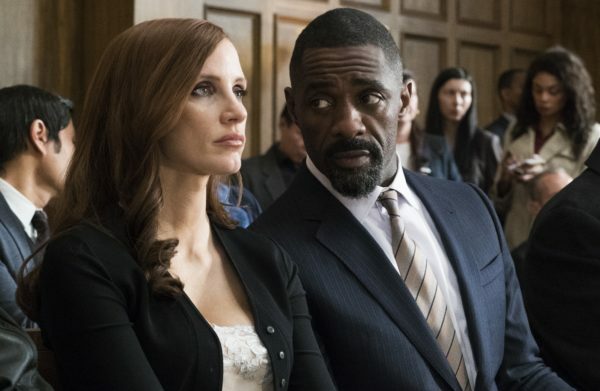 Molly’s Game delivers exactly the sort of screenplay you expect from Sorkin – one with crisp, free flowing dialogue that moves like an express train, driven by a sharp, worldly wit. His direction is in the same mould, moving the story along at an equally cracking pace and giving plenty of insight into the characters. As Molly, Jessica Chastain runs the risk of looking like playing Miss Sloane all over again, but as the defendant, not the attorney. And, while she may be just as immaculately turned out as before, she’s a very different proposition to her forerunner. Shrewd, clear headed and blessed with a large helping of luck, she’s not impervious to emotion and nurses the insecurity that goes with feeling she never had her father’s approval. Her sartorial taste may be questionable at times – some of her dresses have a ring of Erin Brockovich about them and her outlandish stilettos should come with a health warning – but they disguise the computer-like brain ticking away underneath. And she never, but never, gets involved with any of the men she meets at her poker games. A working knowledge of poker isn’t in the least bit necessary to enjoy the film. While there are a couple of instances where playing the game does add to the story, it’s explained in enough detail. What matters is the tension of the scenes, and there’s plenty of that. This isn’t a story about poker. It’s about one woman who picks herself up off the floor when she’s down and makes something of herself. True, it goes wrong, but you’re sufficiently invested in Molly to understand that her crime was to let things get out of hand and she pays a price – not as heavy as it could have been, but she does pay one. And her luck doesn’t desert her when she really needs it. 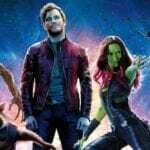 While this is essentially Chastain’s film, it benefits from a quality cast. Idris Elba at last has a role to sink his teeth into as her attorney. Kevin Costner is her dad who she constantly tries to please and, unbeknown to her, always does. 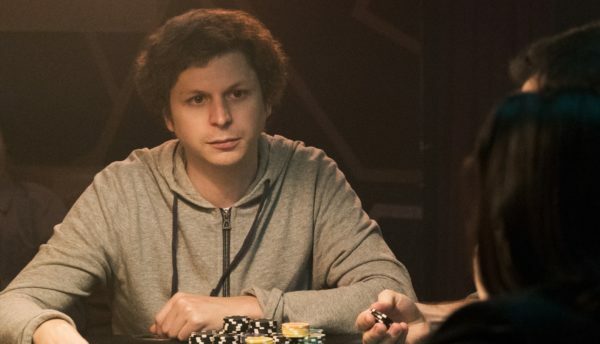 And Michael Cera is Player X – a movie star who’s never identified by name, but also Molly’s biggest fan – for a while. What he can’t handle is rejection. There’s also a nicely dry little turn from Graham Greene as the judge overseeing her case. Molly’s Game is everything you’d expect from the combination of Sorkin and Chastain – intelligent, ballsy, whip-smart, funny and engrossing. New Years don’t get off to a much better start.